Quarter two revealed some of the highest prices on record for Manhattan condos and coops: $1,759 per SQUARE foot. Now, imagine for a moment how many more of those square feet would be available if a developer could scale up multiple extra stories laden with such lucrative commodities. Well, long-time friend of Mayor deBlasio, Jim Capalino has done just that–garnering his client a 55% scaled bump for an overall height ballooning from 185-feet to 287-feet for the bargain basement price of approximately $1,000 per VERTICAL foot! For a $100,000 fee, Capalino & Company orchestrated a lobbying campaign “out of the public eye”. The result–approximately ten additional stories under normal metrics results in significant additional density on the site. Not surprisingly, the New York Post reports that the Board of Standards and Appeals (BSA) which approves such decisions “declined to comment”. This news benefiting 111 Varick Street, but affecting all surrounding neighbors comes on the heels of other dubious decisions. If this news sounds familiar, its not deja vu. 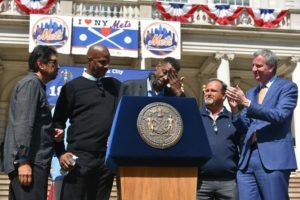 Over the weekend, The New York Times reported on how City Hall hosted a re-enactment of the ’86 Miracle Mets visit to City Hall where pitcher Doc Gooden had to miss the festivities due to drug problems. The Mets current deplorable standings aside, one might question this use of City Resources amid a failing infrastructure and burgeoning homeless problem. Question, until one learns that film’s producer, Amy Heart just made a call and asked Capalino for help. A direct line to City Hall! Problem solved!